When you book your stay in My Way hostel Dubrovnik,you can be sure you booked the best possible experience for backpackers in this Mediterranean gem. My Way hostel is new, but our personal has many years in managing hostels in Croatia. 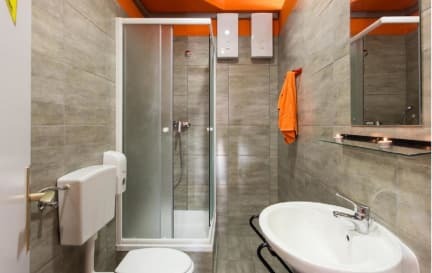 Our contemporary hostel is suitable for all kinds of travelers and our staff's familiarity with the city and Croatia will help you find activities suited to your tastes and interests, as well as recommend hidden treasures of the beautiful city of Dubrovnik. Located 1200 meters from new main bus station, close to several supermarkets, bakeries, shops, restaurants, several ATM-s and banks, pharmacy, post office... Distance from the old town is ca 1,6 km, easy 20 minutes walk or 4 bus stops with the public bus. We have different type of rooms with comfortable beds and air conditioning, bathrooms (each with hot showers), big common room, vending machine with drinks, laundry service, 24 hour reception, free Internet and Wi-Fi. Our facilities also include free lockers and free bed linen. Check out until 11:00 . If you dont check out till 11:30 am - you will be charged one more night!!! Please send us an email or call us if you intend to arrive after 11pm. Taxes not included - occupancy tax 8.00 HRK per person per night ( 1.10 EUR). Off-season CHECK OUT is possible till 11,00 am ! Amazing staff, guy Leo is super nice and so willing to help. Nice receptionist, nice location away from the madness of old town. Grocery store close, but the kitchen only has a toaster, microwave, and hot water kettle. So it’s tricky to try to cook with just those. And there was no hot water from the tap in the kitchen The beds were comfortable and clean , as were the bedrooms. The internet is very slow and disconnects often. I appreciated them letting me leave my bag there before I checked in and after I checked out. One of the staff members was rude to several guest members. He was frustrated when one guest didn’t understand his English & began yelling at him and ordering him around. He was upset I had a beverage in the room, even though there was no rule against it and he seemed irritated with any questions guests had. It could have been an off-week for him, but it was very off putting, and created an uncomfortable environment. The hostel is very clean, but it is far away from the old town where it is the best part of Dubrovnik. The guy from the reception was far from being a nice guy. In the website it says you can pay how you want but you have to pay in cash. The hostel manager is very rude, receiving us with a grump face and getting pissed at us for nothing. The location is quite bad. Again, the hotel manager got offended when we said how far the hostel is from the city center, as he said that the old town is not in the city center. As a tourist in dubrovnik, what you wanna see is basically the old town only. So yeah, it’s kind of a trap. We walked 25-30 mins uphill from the old town. The bus station from the airport is also 30 mins uphill, careful. Overall it was fine enough. Three problems: the staff was extremely unknowledgeable about any questions we had about Dubrovnik. They refused to store luggage. This is the first hostel I have ever been to that wont store your luggage. The staff person said that if I had traveled I would know that most hostels have the same policy. (This is our 3 month hosteling in Europe). And in my opinion the worst part was the staff smoked inside. Its 2018!! The whole hostel reaked of cigarettes. Unacceptable. Staff were sincerely rude. We were yelled at for putting a cup down too hard on a table. The same member of staff called us mother fuckers for using the washing machine with out asking initially although there was no indication to ask. We were also yelled at for getting items from our bags that we left in storage after check. There are much better hostels to stay at in Dubrovnik. Don’t stay here. By far the worst hostel I’ve ever stayed in. staff are unfriendly and unhelpful. Rooms are overly small and no doona blanket was provided. I would not recommend this hostel to anyone ever.